It’s been over three years since we last turned our spyglass on “cinematic electro-metal” act Season of Ghosts. Back then, we did a little write-up on them – and we’re glad to say that they’re still going! The band got in touch recently to offer an update, including some details on their recent release A Leap of Faith. Who are we to refuse…? Season of Ghosts is currently based in London, UK and Tokyo, Japan. I’m Greek, the guys are all Italian. I met Zombie Sam when my record label (back when I was in Blood Stain Child) asked me to consider making a feature on his album. Sam knew Paul and Paul knew Max, so when the project had to go live, we agreed they would support me as session members. Season of Ghosts started out in 2013 as a solo project with session members. With the new album, these members assumed more responsibilities, so I guess playing as a band starts counting from now. I chose the name “Season of Ghosts” because it represents my view of the world as it is today. A world changing, disintegrating and ghosts of the past whispering about the future. The Japanese pop culture and music, Neil Gaiman, Tim Burton. Season of Ghosts’ music is not for the faint-hearted. It’s definitely not for music purists. You need to keep your mind open if you’re gonna listen to our songs. I don’t know if our music is unique or not, but it sure is honest and straightforward and highly intuitive. And full of cat hair. I usually write about spiritual subjects, personal struggles, spiritual growth, the human nature, using your problems as opportunities to become a better person. Many of my songs explore themes like the outer space and the paranormal, like dream paralysis. We haven’t played enough live shows yet, but this is about to change! The shows, according to fans, are like a cathartic experience. People who see us go home filled with a lot of positive emotion. That’s a good thing in my book. I think I’m pretty boring, I don’t do wild things. 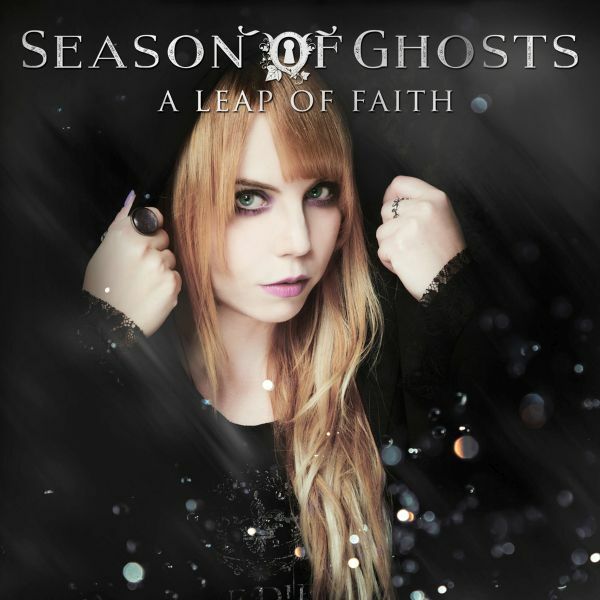 Our new album, A Leap of Faith came out in October and I believe it’s my best work to date. For sure it’s the most honest and straightforward. We’re planning on releasing a second video-clip, the first being “A Place to Call Home” that was released in the summer and planning tours throughout Europe, Asia and the U.S. It could have been anyone, as long as they’re doing it right. I always loved discovering who we were playing with in Japan, when I was in my old band. Every day I’d make new friends and listen to new bands from every region of Japan. I love the element of surprise.